Everyone needs to play a role, including diagnostics manufacturers and even medical device innovators, he said. “There is a gap in responsibility and awareness—we need to engage as many organizations as possible,” he said. Cohen has been with BD for 35 years and is currently engaged in a campaign to raise awareness of antimicrobial resistance and encourage solutions. BD is a member of the AMR Industry Alliance, an industry group working to educate clinicians and policymakers as well as drug, diagnostic, and device companies. The alliance issued its first progress report in January 2018. BD has also recently established the Antimicrobial Resistance Fighters campaign, and 30 organizations have signed on so far. “A lot has to change,” he said. This campaign will bring together public health advocates, clinicians, and patients to raise awareness of the role each can play in addressing AMR. Diagnostics play a central role in addressing antimicrobial resistance, both at the primary care and acute care levels, explains Cohen. “You can adjust patient therapy based on the results of diagnostics,” he said. “The cause of an infection must be properly determined and treated. Currently available diagnostics can be used, but we hope one day to make results available more quickly. Advances are on the horizon, propelled by government funding, established players, as well as startups.” He said that the AMR Review led by Lord Jim O’Neill of the United Kingdom is calling for mandatory testing in developed countries. The AMR Industry Alliance states in its report that it has adopted the following definition for appropriate use of antimicrobials: "The right patient receiving the right drug at the right dose in the right formulation at the right time for the right duration for the right pathogen and site of infection.” There is progress toward ensuring that antibiotics and antimicrobials are used appropriately, but work remains, according to the report. Diagnostic tests also need to be better understood by patients. “Patients need to increase their awareness of them and request their use,” he said. AdvaMedDx is also advocating for greater awareness of diagnostics. In addition to diagnostics, medical device innovations are needed to help reduce infections. “Proper site preparation is needed for any invasive procedure, such as surgical and IV site procedures,” said Cohen. “Infection prevention and control must be improved. There is room for progress here.” The AMR Alliance report noted innovations like the ETN PROtect, which addresses implant-associated infections through an implant coating that releases antibiotics to protect against bacterial colonization of the implant. Above: This image is a part of a larger graphic provided by BD. The 6th reference pertains to CDC’s report, Making Healthcare Safer; the 7th is CDC’s Antibiotic Resistance Threats in the United States; the 8th is from a JAMA article, "Prevalence of Inappropriate Antibiotic Prescriptions among U.S. 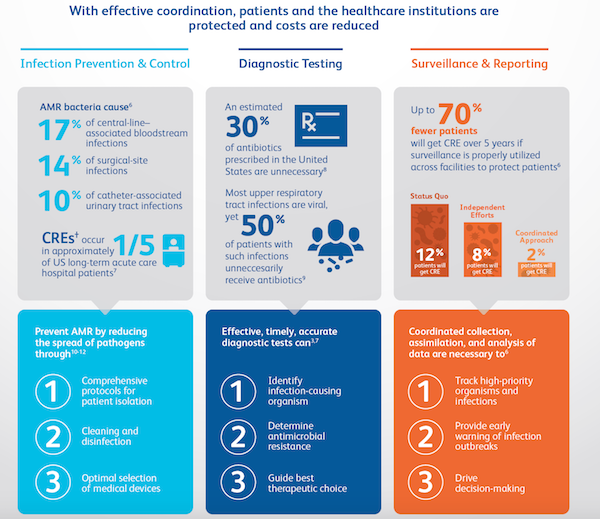 Ambulatory Care Visits"; and the 9th is a Clinical Infection Disease article, "Better Tests, Better Care: Improved Diagnostics for Infectious Diseases." When asked whether easier-to-use products could help reduce the risks for healthcare associated infections, Cohen said that the more procedures can be simplified, the better. However, procedures involving central lines and catheters are largely “technique-oriented procedures,” so manufacturers could help with training. Even something as basic as handwashing needs to be stepped up. “In some cases, it still is not being done properly,” he said. And, of course, there is always the need for new antibiotics and antimicrobials, and then development of the corresponding diagnostics that can detect resistance. But “there’s little in the pipeline,” he said. “It is a complex investment—there have to be changes in market incentives.” Once a new antibiotic is developed, for instance, it should be used appropriately and sparingly to avoid resistance. But if behavior and processes in healthcare don’t limit their use, as soon as these products are developed resistance will start, he warned. Ultimately, the AMR Industry Alliance calls for “new collaborations and opportunities to engage in open-innovation initiatives.” Cohen agrees. Fighting AMR requires a large, coordinated global effort, which is one of the reasons BD established the Antimicrobial Resistance Fighters campaign. “We saw a gap and believed that by encouraging the sharing of stories and experiences from those on the frontlines of health care, as well as AMR survivors, we would be able to educate people about how individual actions can contribute to and help prevent AMR, and help encourage both personal responsibility and innovation. By shining a spotlight on what people are doing to combat AMR, we hope to inspire others to follow their lead— from healthcare providers and microbiologists to hospital workers, patients, and more.” Cohen also invites individuals themselves to become “resistance fighters” and pledge to take action with the Antimicrobial Resistance campaign.